If I were Donald Trump, I’d make the Jews see that I expect them to unite, because everything depends on them. The Trump Administration recently launched a website offering Americans an opportunity to share ideas and suggestions “on how the government can be better organized to work for the American people” and “drain the swamp,” as the site puts it. In my view, this is a mature and welcome approach to governance. The site asks people, “What agency would you like to reform?” But as I see it, here lies the catch: The problem is not with agencies, but with the people who run them. As is happening throughout society, the people who run the government are becoming so alienated and narcissistic that the system itself is becoming dysfunctional. Every rule or regulation is established in order to cope with a specific challenge or a group of challenges. The United States Department of Homeland Security, for example, deals with anti-terrorism, border security, immigration and customs, cyber security, and disaster prevention and management. It was created in response to the September 11 attacks. But it has not solved these problems. All we get are more rules and regulations attempting to deal with these problems—to no avail. Likewise, in 1970, the US government created the Environmental Protection Agency in order to protect human health and the environment by writing and enforcing regulations. Yet, despite an annual budget exceeding eight billion dollars, the environment is still growing increasingly polluted, and the quality of our air, water, and food is declining. As it is with the Homeland Security Department and the EPA, so it is with the Department of Health and Human Services, Department of Justice, Department of Education, and every department that the government has ever established. They are all drowning in a swamp of regulations that have rendered them dysfunctional. When the first Jewish settlers came to settle in the Hula Valley in northern Israel, the area was nothing but a swamp. In order to dry it, they had to unclog the outlet, a section of the Jordan River, which was full of silt. Once they accomplished this, the Hula Swamp was drained out in no time, leaving behind lush fertile soil for cultivation. In much the same way, the cork blocking the government from establishing an effective administration is the alienation and narcissism rooted in human nature. 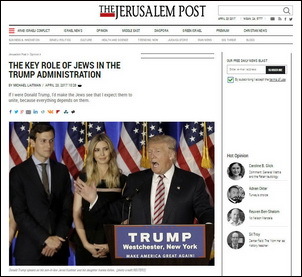 To drain this swamp, US President Donald Trump will have to first deal with the disunity in the American society, and the Jews in his administration are the key to his success or failure. The Jews exist, despite all the persecutions, because there is a purpose to their existence. They were created in order to be “a light unto nations,” to lead the world from darkness to light—from hatred to love, from separation to connection. For this reason, the Jews were declared a nation only after they committed to be “as one man with one heart.” When a man asked Old Hillel what to do in order to convert, the sage told him “That which you hate, do not do unto your neighbor; this is the whole of the Torah” (Talmud, Masechet Shabbat, 31a). Even the religions that emerged from Judaism recognize its seminal importance. The New Testament writes, “for salvation is from the Jews” (John 4:22), and the Quran states, “O children of Israel, call to mind My favor which I bestowed on you and that I made you excel the nations” (The Cow, 2.47, 2.122). In the end, there is no escape from the realization that the world expects nothing less from us than Tikkun Olam (the correction of the world). For this reason, the Jews in the Trump Administration and in his family are in the ideal position to at least begin to carry out our nation’s vocation. While Abraham realized that the ego is continuously growing, he also realized that instead of pointlessly fighting it, people should focus on tightening their unity to match their growing mutual hatred. This realization was key to the uniqueness of the nation that emerged from his descendants: the Jewish people. Abraham’s type of unity was no ordinary unity, but rather one that was forged so as to overcome the fiercest hatred. Abraham accepted everyone into his group, without any discrimination or preconditions other than the willingness to unite. As a result, the people who became his disciples came from all over Babylon. This makes Judaism a unique nation—fashioned not by tribal affinity but by an ideology of unity above hatred, and consisting of “representatives” of all the nations of the world. Tikkun Olam, therefore, is in our DNA! When Moses came out of Egypt, he wanted to continue where Abraham had left off. The Ramchal writes in the Ramchal Commentary on the Torah, that Moses “wished to complete the correction of the world. However, he did not succeed because of the corruptions that occurred along the way.” Nevertheless, as soon as the Jews were declared a nation, they were tasked with being “a light unto nations,” specifically, completing the task of uniting the world. In many ways, the United States is modern-day Babylon: a collection of ethnicities, cultures, and races. As was Babylon in the days of Abraham, today’s US is in crisis. The swamp America is drowning in is not the bureaucratic labyrinth that Trump inherited from his predecessor, but the quagmire of hatred and alienation engulfing the American society. The Jews in Trump’s administration have a key role to play in draining it: to start working on their unity and thereby pull out the cork that is damming the drain. If they begin to cultivate “real and true unity,” as the Lubavitcher Rebbe put it, they will unleash the powers of unity that date back to the formation of the Jewish people. But it must not end there. The unity must encompass the whole of the Jewish people, and subsequently, the whole of American society. Tikkun Olam begins within, but it must not end there. When people utter anti-Semitic tirades such as Mel Gibson’s, “the Jews are responsible for all the wars in the world,” it implies that they believe that it is our responsibility to fix it. Even our own sources tell us: “No calamity comes to the world but because of Israel” (Talmud, Masechet Yevamot, 63a). Because people feel this in their guts, whenever and wherever there is a crisis, the Jews will be held responsible. And indeed we are. If I were Donald Trump, I would pressure the Jews to unite. Not violently, but I would certainly make them see that this is what I expect from them. Even a rabid anti-Semite such as Henry Ford saw the role that Jews should play: “Modern reformers, who are constructing model social systems, would do well to look into the social system under which the early Jews were organized” (The International Jew —The World’s Foremost Problem). If Ford could see this, why can’t we? When we unite, it will immediately reflect on the entire world. As Ford put it, humanity seeks to take example from the Jews. And since the Jews are separate from one another, they need reminding of their calling. We must not wait for others to compel us. We must remind ourselves that the separation between us is growing precisely so that our unity will grow, as well, and cover our hatred with love for one another, just as our ancestors did. The sooner we begin, the easier it will be to drain the swamp of hatred spreading through America. Question: About two years ago a particular incident happened to me. I was taking a walk with my wife and two children. We were walking down the street, it was a Saturday, there were no cars on the street, and everything was very quiet and pastoral. We walked up to a pedestrian crosswalk and calmly crossed the street since there was not a soul around. Suddenly we noticed that our son hesitated a little while crossing and precisely at that moment a car appeared, moving at an insane speed, and hit him, throwing him from his bicycle onto the street. We couldn’t understand where it came from, there were no cars around. And how could the driver have hit the child, didn’t he see the entire road? We later found out that the driver was preoccupied by a conversation with his passengers. The entire story ended fine, and my son was practically unharmed. It was just like a movie! It’s hard to believe how something like that could happen and ended without greater loss; the risk involved could have been fatal. In a situation like this, is there personal protection from above or not? Answer: There is no personal protection. Personal governance is directed only toward bringing the individual to conscious connection with the system of nature. And everything else happens only according to the system’s need to move toward revelation of the force acting within it. If such an event occurred, it means that it was supposed to happen in one of the elements of the system. “Personal governance” means that one of the elements stands out from the entire system by his own unique inner qualities and surpassed all remaining parts of his development. This kind of development raised him to a different level with respect to his generation because he needed to rise and carry out a particular mission. But in the incident with the car and the boy, there is no personal governance. There is a system that had to work out all these events in this way in order to give specific knowledge and sensations to the child, to the whole family, and to the driver. You had to enter into contact with each other, possibly only for that moment, and then to part and move on to further development. But no matter what happens, it happens only to advance us toward the attainment of the force that drives the system. There is nothing that happens outside of this program and this goal. Special protection from above exists only for those chosen people who achieved a certain, individual development with respect to the upper force. It is as if they leave the general masses and begin to develop their perception and understanding, working within the system individually and taking on the functions of the upper force. They then plug into the system in a special way and fall under individual governance. But this is only because they rose above the general governance. They no longer belong to it, but want to function according to personal governance. They have a special mission and these are special people. It’s similar to the way there is only a handful of people who stand at the head of the government and make decisions for the entire country. Although in ordinary life, it only seems to us that the government decides something; in reality it is completely in the hands of upper governance. General governance implies that everything in this world happens by order of the upper system. And personal governance is when a person begins to develop personal awareness, recognizing this system and taking into his hands control over it. He is the only one who receives personal governance because he takes on additional functions, which he is able to execute, thereby taking it away from the upper force. This is only related to the inner development of a person, and not to the external events happening in our lives. This is the only thing in which there is freedom of choice for the individual: to take the steering wheel into his own hands. Question: Can a husband and wife discover the presence of the upper force together like in a spiritual group of ten? Answer: I don’t think that this is possible today because the world has reached a state where we need to work in groups of ten and show an example to everyone. Becoming an example will allow us to carry out an application for all the rest of the world through ourselves. So today such things no longer work. I have not seen an example of a husband and wife who have revealed the presence of the higher power. But in the past, 2,500 years ago, even before the destruction of the Temple, this was the case. Question: Does this mean that you believe that future development will be through groups of ten? Will the entire world be divided into small groups of people within which they will attain their soul? Answer: Every person will be integrated into groups of ten. Groups of ten could be arbitrary or assigned this way today and tomorrow differently—just like everything changes in a person’s body and is constantly in motion. Question: Does that mean that we are not talking about ten specific bodies? Answer: No, not necessarily. In the meantime, this is how we are operating, and later we will see that the groups of ten can be arbitrary. Question from Facebook: You always say that a Kabbalist must limit himself to the necessary minimum. But the minimum is different for each one. How is it possible to determine the limit? Answer: A person determines this limit himself by directing all his thoughts and characteristics to uniting with others and through them to unity with the Creator. At the same time, it is natural that the rest of the small desires, drives, and interests will be nullified. Even though I consider myself to be a Kabbalist and am specifically involved with this most of the time, I must write and explain the wisdom of Kabbalah to people. So, I listen to the news and watch popular scientific programs in order to conduct my lectures and talks on the basis of this. Besides that, I love good jokes and stories because this shows how much the human intellect can turn everything around and discover the union of opposites. In principle, this is exactly what is found in a good joke. Question: Are the minimum necessities a forced equality so everyone will be on the same level? Answer: No. Not in any way. The main thing is for a person to find an important purpose in life and everything else he does will be subordinate to it. Everything else will be secondary. So everything will get along, becoming natural. I learned this from my teacher. He loved walking in the park, eating well, going to the sauna, and swimming in the sea. But all this was so minor compared to his spiritual pursuits, with the height at which he was, this was perceived as concomitant. A person must determine and define the goal precisely. Then the necessities will take care of themselves. Be More Serious In The Sand-Box! Question: What is the state in which people feel that they are one whole? Answer: It is a feeling that cannot be compared to anything else. There are no such feelings in our world. By tearing myself from my egoism and gluing the altruistic part that is born in me to the other friends who have also inserted their altruistic part into the general system, we create a collection of such particles. 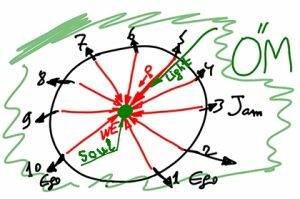 The soul is one for all, and each one who joins the center of the ten begins to feel the general system called a soul through it. Question: Is the energy, the force, that connects people fixed? Answer: The system itself is fixed but our attitude toward it is not, because we are in perpetual motion in our attempt to attain it. In other words, the system is fixed, but we are constantly moving with regard to it in order to attain it more and more. Torah, Deuteronomy 22:10 – 22:11: You shall not plow with an ox and a donkey together. You shall not wear a mixture of wool and linen together. This is the law of the middle line. The donkey and the ox symbolize the right and left lines that can’t be joined together. The donkey is kindness, and the ox is stubbornness (the left line). The left line is egoistic desires, and the right line is the altruistic qualities that we receive from above. However, they should be correctly balanced in the middle line. The same is true regarding the ban on wearing clothes from mixed fabric. You can’t mix wool and linen that symbolize the two lines, because by this you cause a “short circuit,” and everything you do this way won’t give any good result.